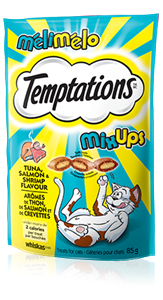 TEMPTATIONS® Mix-Ups Tuna, Salmon, and Shrimp is rated4.6 out of5 by76. Rated 4 out of5 byEMILYCBC_3691422279 fromI've tried a lot of different brands of treats for my cats, and Temptations has always been their favourite overall. I'd never tried this flavour before so I was excited to give my cats something new to enjoy. They really loved them! My youngest cat couldn't even wait for me to get them out of the package, he was trying to pull my hand out of the bag so he could get in there himself. The only thing I don't like about them is that they're obviously not good for my cats' health. I prefer to feed them food that's higher quality and more natural. However, when it comes to treats I'm more relaxed about it because they don't eat it every day. And with how much my cats all love it, I just can't say no. Rated 5 out of5 bymelissa short fromFoxy talking hereFoxy talking here.... I love the mix-up treats , they are wonderful because in each mouthful I will get three different flavors of treats. I eat at least 5 packs of treats throughout a week. Crazy right but that's it. .. P.S. this is Melissa talking to me, ha . I would also like to mention is that is the only kind of treats that Foxy will eat. I would love to have coupons send to me please. Unfortunately you cannot get many around here. Rated 5 out of5 byErica fromKitty CrackI don't know how your products are so addictive for cats but my cat is insatiable with any temptations. She will harass us constantly for more. Could you make a soft temptations product for the many cats out there with gingivitis and teeth extractions who have trouble with hard food. I can't even find a cat food that is a soft, dry food. As for treats, there are Luvs that are soft but my cat hates them. Rated 5 out of5 byKittyskeeper fromCat loves them!I’ve been buying these for my cat for many years and she absolutely loves them. Will sit by the cupboard where I keep them and wait as long as it takes for me to give them to her every morning when I get up and everyday when I get home from work. No exceptions! :) And it really does take just a shake and she’s there waiting for them! Rated 5 out of5 byNADIAWBC_4281402735 fromMy cat absolutely loved it! I could barely open the package and she was going crazy. She gets a few treats every night and if I'm late she lets me know with her very loud meows. I put them in a puzzle ball and she works at it until every piece is devoured! Thank you for allowing Kai to try Temptations MixUps for free. Rated 5 out of5 byDANZBC_3691403166 fromMy cat is very picket when it comes to treats. This particular flavour was a huge hit! After the first time he tried them he recognized the sound of the bad each time I went to give him some. He went crazy every time he hears the bag now! I will be a consistent customer of this brand and flavour future forward. Rated 4 out of5 byMARYBBC_3691420579 fromMy cat always loves Temptations, especially the fishy flavors. This is a great mix of all the fishy flavors in one treat. Sometimes I wish my cat could talk so he could let me know his preferences, but with these treats his preferences are clear, even if he can't talk! Rated 5 out of5 byMiky08 fromAmazing MaterialIve been buying this since my cat was 8 months old she’s now 6 and continues to love it like the first day we brought it home. Great flavor perfect size and love the fact that you can shake it my cat actually comes running as soon as she hears me take out the bag! Chicken By-Product Meal, Ground Corn, Animal Fat (Preserved with Mixed Tocopherols), Dried Meat By-Products, Brewers Rice, Wheat Flour, Natural Flavour, Grain Distillers Dried Yeast, Potassium Chloride, Choline Chloride, Salt, Taurine, dl-Methionine, Calcium Carbonate, Vitamins (Alpha Tocopherol Acetate [Source of Vitamin E], Vitamin A Acetate, Niacin Supplement, Vitamin B12 Supplement, Riboflavin Supplement, Thiamine Mononitrate, d-Calcium Pantothenate, Vitamin D3 Supplement, Biotin, Pyridoxine Hydrochloride [Vitamin B6], Folic Acid), Minerals (Zinc Sulfate, Copper Sulfate, Manganese Sulfate, Potassium Iodide), Iron Oxide, Titanium Dioxide, Mixed Tocopherols (Preservative), Natural Tuna Flavour, Salmon Meal, Shrimp Meal, Dried Cheese. TEMPTATIONS® Mix-Ups Tuna, Salmon, and Shrimp Flavoured Treats for cats is formulated to meet the nutritional levels established by the AAFCO Cat food Nutrient Profiles for all life stages. AAFCO stands for the Association of American Feed Control Officials. AAFCO develops standards for dog and cat nutrient profiles which are used as model regulations in the United States. AAFCO feeding protocols are referenced the "Guide for the Labeling and Advertising of Pet Foods" endorsed by the Competition Bureau of Canada as well as in the Guidelines for the Canadian Pet Food Industry, developed and administered by the Pet Food Association of Canada. These documents were created to help pet food manufacturers ensure that the food that they manufacture, distribution and sale of animal feeds are safe and of high quality.